↑ "Le Corbusier's Capitol Complex a mess, in dire need of facelift". indianexpress.com. 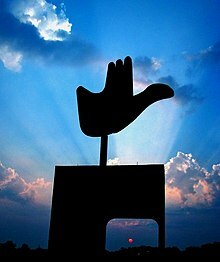 ↑ "Chandigarh's Capitol Complex is now a युनेस्को heritage site". अभिगमन तिथि 18 July 2016. ↑ "Chandigarh's Capitol Complex is now a युनेस्को heritage site: All you need to know". hindustantimes.com. 18 July 2016. ↑ "Capitol Complex, as Le Corbusier wanted it, remains incomplete - Indian Express". indianexpress.com. ↑ "युनेस्को approves all 3 Indian nominations for heritage tag". intoday.in. ↑ "Four sites inscribed on युनेस्को's World Heritage List". whc.unesco.org (अंग्रेज़ी में). युनेस्को World Heritage Centre. 15 July 2016. अभिगमन तिथि 15 July 2016.